What better way to spend Memorial Day than watch the remaining episodes of HBO's "The Pacific" on my DVR? To be honest, when my most difficult decision is what relic of the 1980s or 1990s to revisit for one of my posts, it's difficult to imagine the sheer magnitude of what American soldiers have sacrificed during the history of this republic. But that is precisely why we have this day, Memorial Day, to honor their service. So, today, we pause to reflect upon their commitment to our nation and the bravery they have exhibited both in war and peace time. 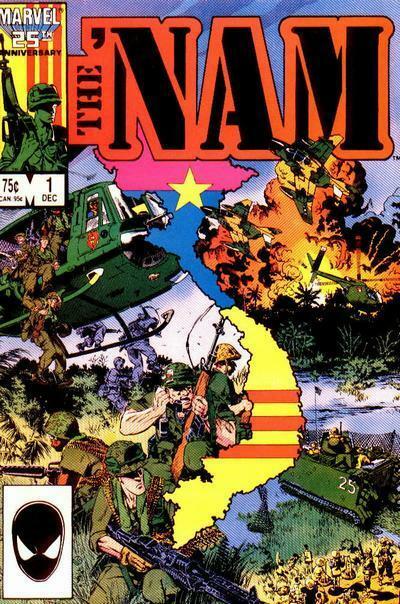 Incidentally, depicted above is the cover of the first issue of The 'Nam, a comic about the Vietnam war published by Marvel Comics in late 1986. 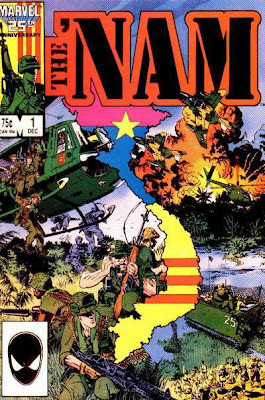 Because of my father's service in that conflict, I began to collect this series soon after its release to learn a bit more about it. I have been meaning to revisit it, as well, as I know that its issues have been collected in a series of trade paperbacks. So, dear readers, look out for a review of that series on the horizon.